How is lung cancer different in women than men? Did you know that symptoms of lung cancer are often different in women than they are in men? It's not only the symptoms that differ, however. Many aspects of lung cancer, from the most common types of the disease to survival, differ between the sexes. Let's take a look at the ways in which lung cancer is unique in women, and what you need to know to make sure you get the best health care possible. Lung cancer in women differs from lung cancer in men in many ways. Yet, despite obvious differences in our appearance, we tend to lump men and women together when talking about the disease. This is unfortunate, since the causes, response to various treatments, survival rate, and most common symptoms differ. What are some facts about lung cancer in women? Lung cancer is the leading cause of cancer deaths in women, killing more women each year than breast cancer, uterine cancer, and ovarian cancer combined. While smoking is the number one cause, 20 percent of women who develop lung cancer have never touched a cigarette. In addition, lung cancer is more likely to occur in former smokers, those who have kicked the habit, than women who currently smoke. Once considered a “man’s disease,” lung cancer is no longer discriminatory. In 2017 it's estimated that 116,990 men and 105,510 women will be diagnosed with the disease. While lung cancer diagnoses have been decreasing for men, they are staying relatively stable for women. That is, with the exception of one group. Lung cancer is increasing in young, never-smoking women. Lung cancer occurs at a slightly younger age in women than in men, and almost half of lung cancers in young adults occur in women. While the reason is uncertain (but not explained by smoking), a 2018 study surprised many when it was found that the incidence of lung cancer in young women was higher than the incidence in young men, and this could not be explained by differences in smoking behavior. Only recently (data from 1995 to 1999) when the incidence was higher in men. Statistics looking at the incidence based on gender from 2010 to 2014 found that women accounted for more than 50 percent of lung cancer cases in those aged 30 to 34, 35 to 39, 40 to 44, and 45 to 49. Small cell lung cancer, which accounts for 15 to 20 percent of lung cancers. Non-small cell lung cancers are by far the most common type of lung cancer in women. Small cell lung cancers are also more common in men, but it is much more likely for a man to develop small cell lung cancer than a woman. Small cell lung cancers tend to spread more readily, and because of this may account for some of the differences in prognosis between the sexes. Squamous cell carcinoma of the lung, which adds up to around 30 percent of non-small cell lung cancers. Large cell lung cancer, which accounts for roughly 10 percent of these cancers. Lung adenocarcinoma is by far the most common type of lung cancer in women, and is also the type of lung cancer which is least associated with smoking. Men are more likely than women to develop squamous cell lung cancer. BAC (Bronchioalveolar carcinoma), a condition which has been reclassified as a form of lung adenocarcinoma, is a rare form of lung cancer that is more common in women. For unknown reasons, the incidence of BAC (now classified as lung adenocarcinoma) appears to be increasing worldwide, especially among younger, non-smoking women. These differences in types of lung cancer between men and women may account for some of the differences in symptoms which are most common in men and women. Even though smoking is the number one cause of lung cancer in women, a higher percentage of women who develop lung cancer are life-long non-smokers. We've learned that the symptoms of heart attacks are different in men and women and the same is true for lung cancer. Men who have lung cancer are more likely to have a persistent cough, cough up blood, or develop respiratory infections due to tumors blocking the airways. In contrast, the first symptoms of lung cancer in women are often a vague sense of shortness of breath (sometimes attributed to age or weight gain or being out of shape) and fatigue. These differences in symptoms may be at least in part related to differences in the type of lung cancers between men and women. In contrast, lung adenocarcinoma is by far the most common type of lung cancer in women. These tumors usually grow in the periphery of the lungs, far from the large airways. For this reason, they are less likely to result in a cough, cause a person to cough up blood, or obstruct the airways leading to infections. Instead, adenocarcinomas can grow quite large before they are detected. This growth can lead to slowly worsening shortness of breath, and fatigue. Often times women do not have symptoms until these lung cancers have spread (metastasized) to other regions of the body. Metastases to the brain may cause eye symptoms, numbness or weakness. Metastases to bones can cause bone pain, back pain, chest pain, or shoulder pain. Other symptoms may occur that are related to metastatic cancer in general, such as unintentional weight loss. As noted above, the most common types of lung cancer in men tend to grow near the central airways. These tumors tend to cause symptoms earlier on in the course of the disease, with symptoms related to the presence of the tumor near the airway. As such, coughing up blood, obstruction leading to lung collapse (atelectasis), and coughing might be seen earlier in lung cancers found in men than they would be in women. Another group of symptoms that are seen occasionally with lung cancer is something called paraneoplastic syndrome. A paraneoplastic syndrome is a group of symptoms caused by hormone-like substances secreted by tumors and is seen most often with small cell lung cancers, squamous cell lung cancers and large cell carcinomas—cancers that are found more often in men. Paraneoplastic symptoms may include an elevated calcium level in the blood (hypercalcemia), a low sodium level, weakness in the upper limbs, loss of coordination and muscle cramps among other symptoms. The treatments you and your doctor choose will often include a combination of therapies. To understand how these are used, it can help to define the purpose of these different treatments. Local treatments - Local treatments are designed to remove cancer cells at their source—locally—and include surgery and radiation therapy. Systemic treatments - Systemic treatments are designed to address cancer cells anywhere in your body, not just your lungs. This is important if your cancer has spread beyond your lungs, or if there is a chance that at least a few cells have traveled beyond your lungs. Systemic treatments include chemotherapy, targeted therapies, and immunotherapy. For early stage lung cancers (stage I to stage IIIA) surgery may offer a chance for the cure. There are several different types of lung cancer surgery that may be chosen depending on the size of your tumor and its location. Women who have lung cancer surgery tend to fare better than men with these procedures. In one study, the median survival after surgery for lung cancer was twice as long for women as for men. Radiation therapy may be done for several reasons. In early stage lung cancers that are inoperable for some reason, a technique called stereotactic body radiotherapy (SBRT) may offer a chance for a cure. Radiation therapy is commonly done (external beam radiation therapy) following surgery to clean up any remaining cancer cells. It may also be done prior to surgery along with chemotherapy in an attempt to decrease a tumor to a size that can be removed with surgery. Radiation therapy may also be done as a palliative treatment—a treatment designed not to cure cancer, but to extend life or improve the symptoms of the disease. In recent years, SBRT has been used for some people with only a few metastases to the brain from stage 4 lung cancer. While this is not often an option, removal of "oligometastases" in this way has resulted in long-term survival for some people. Women historically respond to a few chemotherapy medications used for lung cancer better than men. Everyone who has non-small cell lung cancer should have gene testing (molecular profiling) to look for targetable mutations, and it appears that having one of these mutations, especially EGFR, is more common in women than men. At this time, treatments are available for those who have EGFR mutations, ALK rearrangements, ROS1 rearrangements, and more (such as RET mutations etc.) with other treatments being explored in clinical trials. Tarceva (erlotinib) also appears to be more effective for women. Immunotherapy is an exciting new approach to treating cancer, with three medications in this category having been approved for lung cancer since 2015. The National Cancer Institute recommends that people with lung cancer consider participating in clinical trials. These trials not only help to advance research in lung cancer but, at times, offer people life extending treatments that are otherwise not available. The survival rate for lung cancer in women is higher than for men at all stages of the disease. Sadly, the overall 5-year survival rate is only 18 percent (vs 12 percent for men), but this number will likely increase in the near future. As an example to illustrate this hope, there were more new treatments approved for lung cancer in the period between 2011 and 2017, than during the forty years preceding 2011. It may help to keep in mind that survival rates are estimated based on statistics on how people responded to lung cancer treatments in the past. It is likely that estrogen plays a role in the development and progression of lung cancer and research is being done to define this further. Women who have their ovaries removed surgically before menopause may be at higher risk of developing lung cancer. 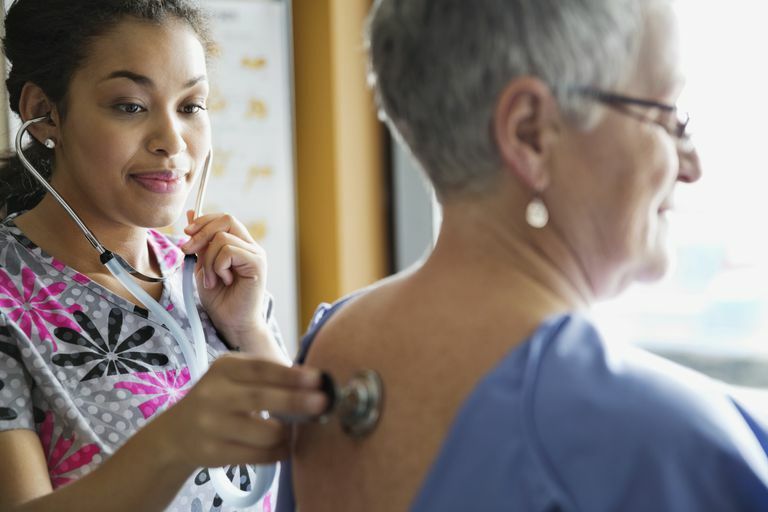 Recent research suggests that treatment with estrogen and progesterone (hormone replacement therapy) after menopause may increase the risk of dying from lung cancer. In contrast, the use of estrogen therapy alone has been associated with a lower risk of dying from the disease. In contrast, both the use of birth control pills and hormone replacement therapy (excepting those who use hormones after surgical menopause) are associated with a lower risk of developing lung cancer. This contrast between dying from and development of lung cancer suggests that estrogen plays more than one role in lung cancer. If we were to name the number one thing anyone could do to improve their survival with lung cancer, it would be to advocate for yourself. If you become involved in the lung cancer community, you'll meet several women who are alive only because they became involved and learned about newer treatments. Lung cancer treatments are changing rapidly. Learn how to research your cancer online and find credible information. You will also want to discover how to be a self-advocate in your cancer care. Thankfully, you don't have to do this alone. In addition to the lung cancer community, several of the lung cancer organizations have worked together to form a lung cancer clinical trial matching service. With this free service, a navigator can review your specific diagnosis and check for clinical trials taking place anywhere in the world that may be an option for you. If it's your loved one who has been diagnosed with lung cancer you may be feeling overwhelmed and helpless. How can you best support your loved one with cancer? Take a moment to step into her shoes. The most important thing you can do is listen and be there. One of the greatest fears of those with cancer is that they will be alone. Even though many more women die from lung cancer than breast cancer, much more funding is devoted to breast cancer research than lung cancer research. Many people are working tirelessly to reduce the stigma of lung cancer and to increase both private and public funding for the disease. Thankfully, even though lung cancer is the leading cause of cancer deaths in women, there are some things you can do to lower your risk. Check out these superfoods that may reduce lung cancer risk, and, if you're already living with lung cancer, take a moment to learn about these lung cancer-fighting foods. Lung cancer is in many ways a different disease in women than in men. Fortunately, these differences are becoming more clear as we learn more about the molecular variations between different cancers. With lung cancer in women being nearly as common now as in men, it's likely that we will discover further differences that can be used to guide treatment and personalize lung cancer care. Ben Khedher, S., Neri, M., Papdopoulos, A. et al. Menstrual and Reproductive Factors and Lung Cancer Risk: A Pooled Analysis From the International Lung Cancer Consortium. International Journal of Cancer. 2017. 141(2):309-323. Min, L., Wang, F., Liang, S., Yang, J., and X. Xu. Menopausal Status and the Risk of Lung Cancer in Women: A PRISMA-Compliant Meta-Analysis. Medicine (Baltimore). 2017. 92(26):e7065. Stucker, I., Martin, D., Neri, M. et al. Women Epidemiology Lung Cancer (WELCA) Study: Reproductive, Hormonal, Occupational Risk Factors and Biobank. BMC Public Health. 2017. 17(1):324. Jemal, A., Miller, K., Ma, J. et al. Higher Lung Cancer Incidence in Young Women Than Young Men in the United States. The New England Journal of Medicine. 2018. 378(2):1999-2009.